I just returned to my hometown of Los Angeles, California from a two-week trip up the coast. I spent the majority of my time with some new friends from Direct Action Everywhere in Oakland, California. If you haven’t already heard of them, they’re an amazing group of committed animal rights activists whose goal is to inspire the world to pay attention, pick a side and take an active role in the animal rights movement. They believe in total animal liberation, creating and nurturing an inclusive community, telling stories from the animal’s perspective, non-violent direct action and confrontation. They believe that veganism is not enough and that activism is imperative. I completely agree. Right now, the animal rights movement is incredibly pessimistic. Talk to different activists and you’re likely to hear things like “the planet is doomed”, “abolition is not possible right now, so we should fight for ‘humane’ treatment as a means to that end” and “we’ll never change people’s views on animals, but at least we’ll go down fighting”. This is the absolute wrong mindset to have. This is not a winning mindset. We need positivity in this movement not because we want to fool ourselves into thinking something impossible is possible (because it might be possible with far fewer numbers than you think), but because if we aren’t positive, the planet will be doomed, abolition won’t be possible and going down fighting is all we’ll achieve. The truth is, changing people’s views on animals is possible with the right mindset and determination, but it will take all of us inspiring others to take action if we ever hope to achieve it. We have to dream BIG. In a world telling us “no you can’t”, it is up to us to confidently and unapologetically counter “yes we can“. 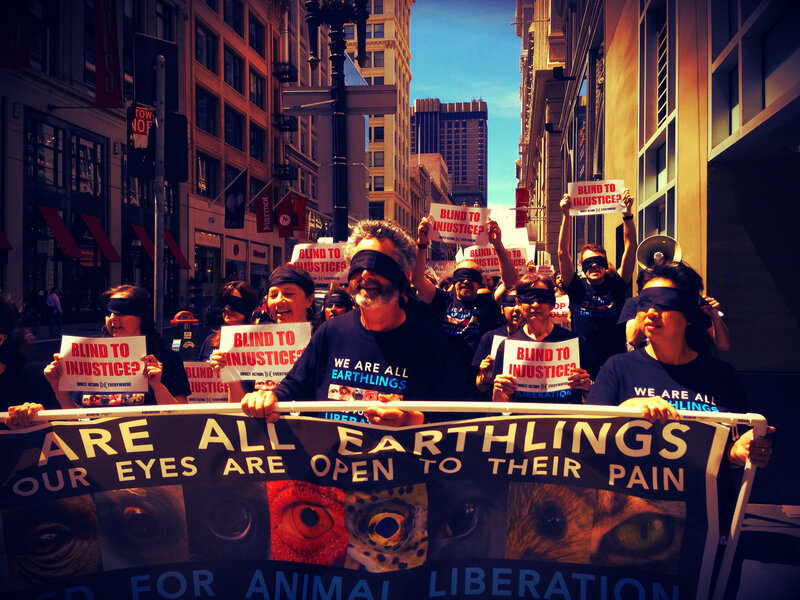 Activists take to the streets of San Francisco, California to demand people open their eyes to the injustices animals endure at human hands. Dreaming big is important, but meaningless if we lack the people-power to make the idea of total animal liberation a reality. As activists, we have to follow through on our words with actions beyond vegan consumerism. Making different shopping and entertainment choices is great, but we are fighting an uphill battle that can only be won if activists will actually get active. Imagine if every time someone took a bite of a hamburger or picked a gallon of milk off the grocery store shelf they received looks of disapproval and words of truth earnestly telling them “this is wrong”. We need to hold people accountable for their actions. We need to wake people up. We need to bring the entire world into the animal rights conversation. The biggest social justice movement of our time is happening right now, but we’re too afraid and timid to talk about it. We are their voice and yet we are silent when it counts most. 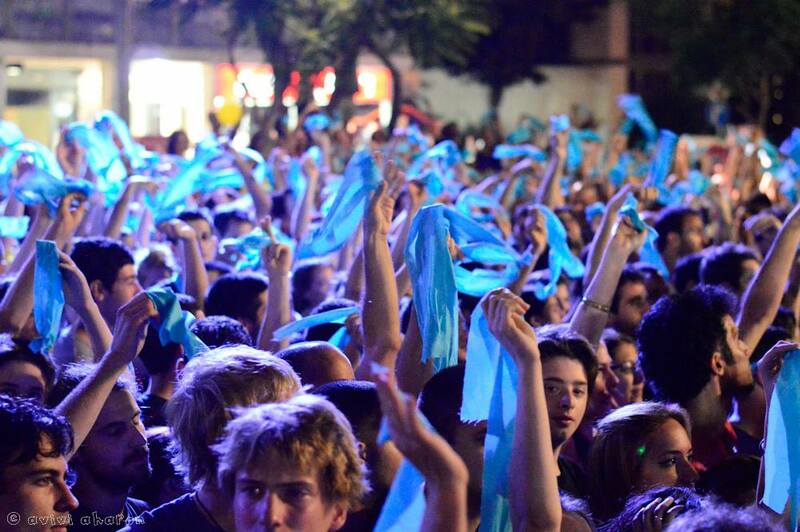 Activists in Tel Aviv, Israel symbolically taking off their blindfolds showing that they acknowledge the suffering of animals and are taking a stand against it. Direct action is imperative. No longer can we allow other members of our species to live in the self-imposed darkness of willful ignorance. No longer can we be appeased by the “victories” of meatless mondays, “humane” murder, and bigger cages. No longer can we be contented by the illusion that change will happen because of how peacefully, respectfully and meekly we waited. If this were any other social justice movement, would we be worried about appearing “pushy”, “rude” or “judgmental” by bringing people’s attention to the violence they are actively participating in by maintaining the mindset that a beings worth is based solely on their utility to humans? If humans were in the animal’s place wouldn’t our actions be different? Would we still be saying “wait”, “be patient” and “not yet”? How is this disparity not speciesist? Confrontation is the seed of change. Without it, the status quo will remain forever. We need to attack this issue with the same urgency we would have if these injustices were instead being dealt to humans. Every time a person purchases or consumes a product of violence, we need to remind them that they are making a choice in support of the oppressors. Willful ignorance is not innocence — there is complicity in every action and inaction which supports oppressive acts. If you wouldn’t sit quietly beside a person slicing someone’s throat at the dinner table, then you should not sit quietly beside a person eating someone’s mutilated body — and if you would sit quietly beside a person eating someone’s mutilated body then you are complicit as well. As Erasmus Darwin famously said: “He who allows oppression shares the crime”. Me inside of a McDonalds during the Earthlings march in San Francisco on August 24th 2013. It’s easy to point at people who are openly and unashamedly speaking out against injustice and say that they are creating problems, but the truth is that the problems were already there to begin with, and these outspoken people are simply forcing others to finally pay attention. Let’s not blame and shame the messenger for delivering truth to a willfully ignorant public. Rather, let’s join them and amplify that message so it can no longer be ignored. We can’t force people to agree with us, but we can force people to listen to us. Revolution is necessary because we will not allow our moral obligation to stand up against tyranny and oppression to be outweighed by the opposition of a morally bankrupt majority. We need to bring the issue of animal rights out into the open so that it can be acknowledged and discussed, agreed with or disagreed with. I’d rather have someone vehemently oppose the idea of animal rights than be neutral to it. I’d rather be jeered and laughed at by people on the street while I hold a sign asking them to question their current habits, because hostility trumps indifference when it comes to changing the status quo. Hostility is an emotional reaction to an emotional issue. Indifference is the lack of emotion — and that is much more disturbing to me. We have to mean it. We have to fight for it. Only then will we get it. This is a great blog post. It is true that if this were any other social movement, we would not be as passive. I 100% support direct action as long as it does not harm people. There is something to be said about living by example and not being aggressive or judgemental as well. I have convinced people to become vegan this way. I think the movement needs both. Kara, we are so god damned lucky to have you as part of this movement. Ignorance has stymied animal liberation for thousands of years – Let’s not allow apathy to hinder it for another day more! The least of our concerns is that people don’t like hearing the message. If it’s truthful and rooted in an appeal for a kinder more just world – Then never let them silence us! Societies centered around animal killing/slavery, will tend to be more violent/slave minded in general, because that is the mind-energy-frequency that is being sent out. Whereas if a society reverses this trend, the well-being of the populace in general improves in many ways (and is that not what most people at least secretly want?). So the people who actively promote care for a wide variety of animals, are doing a huge service to society in general. Thank you all. Great points but why is there a video with that blimp Mario Bitali pimping Hellman’s mayo and preparing Chicken parm . Eeee Gad , Is it because one look at his bloated obese diseased frame would make any sane person go vegan ? I think that’s an ad. The ads are customized per person and what ad it thinks each person wants to see. Lately, I’ve been seeing ads about keeping tabs on “pets” like a way to prevent them from getting lost or hurt. Sorry it’s been showing you icky stuff. I’ll relay this info to WordAds support.